The Product Spotlight at Stamp and Create is Charms. All charms are 25% off. Perfect time to stock up!I love using charms on my cards! Stamp and Create carries a ton of images of Bears. What better way to accent a bear image card than with a cute bear charm. 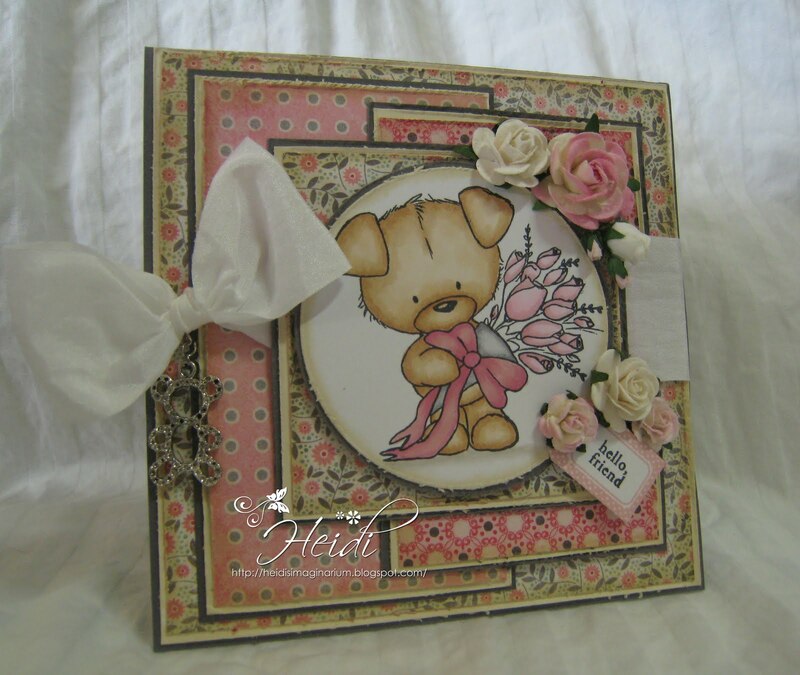 Iused the Large Open Bear charm with the cute Wild Rose Studio Toby with Roses stamp. The paper is from the gorgeous 6x6 My Mind's Eye Stella and Rose Gertie pack. No card is complete without a bow made using the Bow Easy and my favorite go to ribbon White May Arts Silk Ribbon. Heidi, this is just too cute! Love the image and great paper choices and colors! So beautiful card Heidi,I love the image and the colours. Aw!! This is just the sweetest Heidi!! Love the sweet bear, your papers and your layout!! Too cute!! OH this is so sweet Heidi. Perfect in every way. Love your gorgeous sweet card Heidi. How sweet! I love the colors you used and all of the fun layers!! Big hugs! !